Before the economical crisis in 2008, Iceland had been governed by the Independence Party for 18 years, much of that time in coalition with the Progressive Party (both centre-right parties). These parties have fought hard for their heavy industry plans and their biggest achievement was the extremely controversial Kárahnjúkar hydropower plant in the highlands, which was built in 2004-2007 after one of the greatest protest ever seen in Iceland. The power plant has a combined capacity of 690 MW and produces power for the aluminium smelter in Reyðarfjörður on the east coast. It is safe to say that the whole project failed to live up to expectations. Hálslón reservoir can rise up to 57 km2 followed by a great sandstorm risk, workers building both power plant and aluminium smelter were in large part foreigners and the projects did not create as many jobs for Icelanders as promised. The latest impact has been the destrucion of Lake Lagarfljót, now so thick with clay from the diverted glacier river Jökla that little life thrives in it. These things were all predicted by scientists and other specialists but warnings were ignored. Shortly after the aluminium smelter in Reyðarfjörður started operating the whole economy of Iceland collapsed and one must wonder if there was some causal link? After four years under the reign of a left-winged government and a competent Environmental Minister, the tides have now changed. The Progressive- and Independence parties are back in power and already waging a war against Icelandic nature. They want more power plants and they want them fast. Not to create energy for the people themselves but for heavy industry. It would be easy just to bow our heads in defeat and cry silently, hoping that in the next four years the government would not do irreversible harm. But we refuse to do nothing. We will fight and call out to environmentalists in Iceland and abroad to help us. I proudly work for Landvernd, the Icelandic Environment Association, which joined forces with other nature NGO‘s in Iceland and started the Green movement. 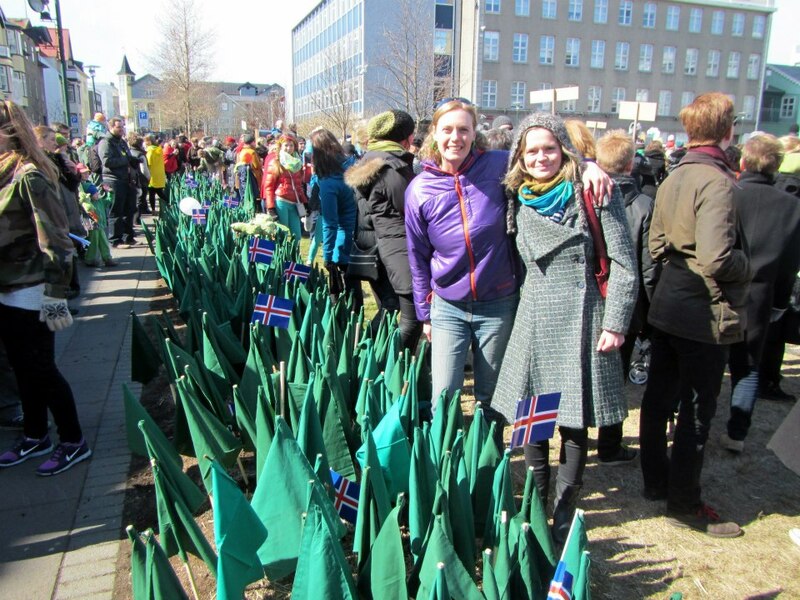 We made 1000 green flags and got 5000 people (in Reykjavík, a city of 120.000 inhabitants) , at a very short notice, to march for nature on 1st of May 2013, carry the flags and symbolically place them in front of the parliament. It was incredible and we felt strong and united. But one green march is not enough, we need to keep moving and grow in numbers. In the first weeks in power, the new prime minister has made some startling statements, one in particular where he belittles the numerous comments from the public, NGO‘s, municipalities and others on the Master Plan for hydro and geothermal energy resources in Iceland. We joined forces again and a couple of thousands of us met in front of the Government House on the 28th of May where the numerous comments were given to the prime minister‘s PA. We raised our green flags to the sky and our hearts filled with hope. We will do it again and again until our voices are heard and our land is safe.